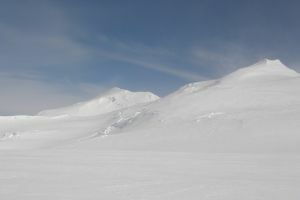 This peak is #2 on the Height List for Yukon Territory .The second highest summit on the Mount Logan massif. The West Peak is often traversed en route to the main summit. It's an easy ascent along its northwest ridge or its short east face. Name Notes: Named after Louis Philippe of France, in accordance with the Kings and Queens theme of the area. Louis Philippe was the last king of France. He reigned from 1830 to 1848. In 1848 he abdicated in favor of his grandson, and then fled to England under the name "Mr Smith". The national assembly planned to accept his son, but due to public opinion instead adopted the "second republic". In some literature this peak is referred to as the "West Peak" of Logan, but this name is now de-emphasized because the peak is actually northwest. The peak is sometimes known as the South Twin; it has been described as one of the three points on the summit crown.